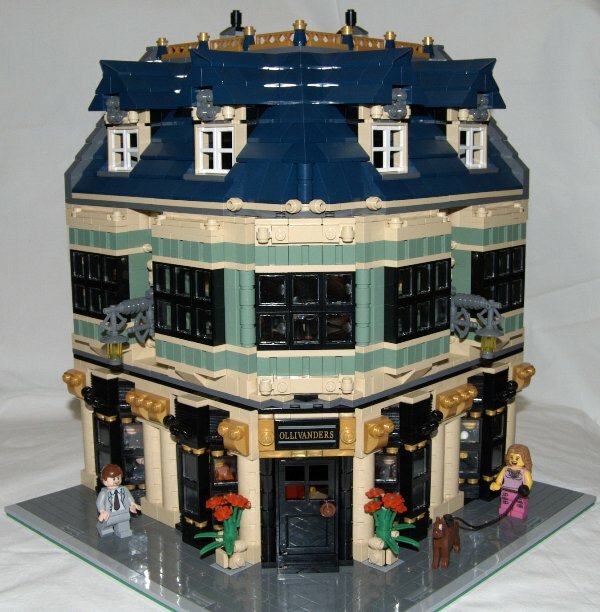 Brick Town Talk: 9mm and a Three-Peice Suit - LEGO Town, Architecture, Building Tips, Inspiration Ideas, and more! 12 Adogin Lane- (BTT) Magic wands just aren't as popular as they used to be, and Mr. Olivander found that end's just weren't meeting for his wand shop, so he closed up and stared into the men's fashion industry! This Modular has quite an interesting colour palette, focusing on secondary and tertiary colours, with nary a red, blue or yellow in sight. The building has a regal air, with the gilded fencing on the roof, cast iron lamps on the second floor, and a perfectly blemish-free sidewalk. It almost puts a spell on you, doesn't it?